For this post I'm sharing my idea of what a 2018 Hyundai Tiburon would look like. The Tiburon was a budget 2+2 sports-coupé sold from 1996 to 2009. The name comes from the Spanish for 'shark'. The images show the Euro-spec 'Coupé'-badged version, but like its predecessors it would be badged 'Tiburon', 'Coupé', or 'Tuscani', depending on the market. Also in keeping with its predecessors, it would be based on the contemporary Elantra/Avante's front-wheel drive platform. It would be positioned as the bigger brother to the Veloster in the Korean manufacturer's lineup. 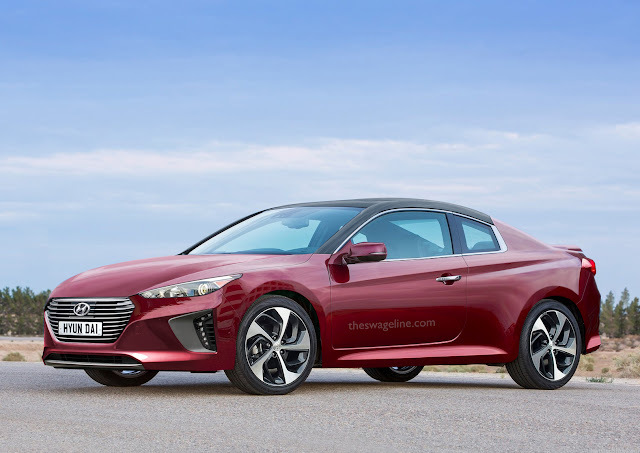 The styling adheres to Hyundai's latest 'Fluidic Sculpture 2.0' design language, and offers extensive customisation options - including two-tone paint with contrasting roof. The photograph above shows the car in Olympian Blue, but some other colour options can be seen below.